Nearly 90% of text messages are opened and read within the first 90 seconds of receipt.1 Now that’s fast! Are you ready? 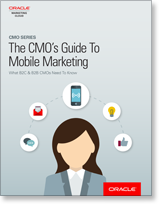 Get your copy of The CMO’s Guide to Mobile Marketing here and then get going!